After playing for a while with the Beagleboard (http://beagleboard.org) Expansion Header now is time to explore the PandaBoard one (http://pandaboard.org). I soldered a couple header sometime ago and finally I found half an hour to play with them. For this brief experiment I used GPIO138 that corresponds to pin 10 on J3 (the header closer to the edge of the board). The "official" name of the pin is MCSPI1_CS1. For details check Table 10 on page 43 of the reference manual (http://pandaboard.org/node/223/#versions). Note that I have a PandaBoard Revision-A. Page and table references may differ from the PandaBoard ES manual. So, /sys/kernel/debug/omap_mux/ contain information regarding the configuration of all the signals we can interact with. In our case, the pin 10 on J3 is configured by default a a GPIO with number 138 (we already knew that :) and it is using a pulldown resistor. That means that we need to connect our button to PIN 10 and to 1.8V (PIN 1) and then, every time we press the button we will read a 1. Otherwise we will read a 0. So far so good. But what is interesting is that we can configure pins on the expansion headers using the kernel debug pseudo file system. 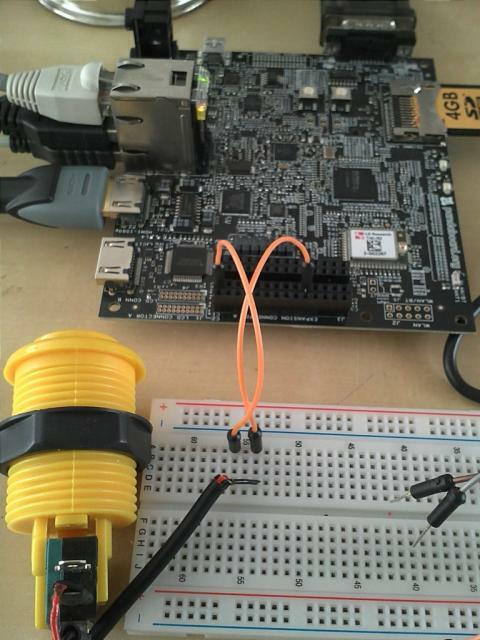 For a very detailed explanation check this article http://www.blaess.fr/christophe/2012/06/04/gpio-pandaboard-et-temps-reel.... It is really good with a lot of very interesting information. Google translation may be handy. Bit 4: Select Pull-up or Pull-down. For those of you wondering about where this information come from you need to check that huge OMAP4 TRM (look for yours in this page http://www.ti.com/general/docs/wtbu/wtbudocumentcenter.tsp?templateId=61...) , actually you need to look into section 18.4.8 and suddenly everything will make sense. We need to look to the flags... that is the value 0x010b in the first line. If you want to know why we have to look at this one check the mux.c file for the omap architecture in the linux kernel.... It is interesting... really.